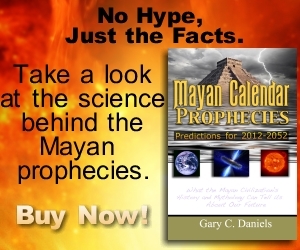 Around 850 BC new people arrive in Florida possibly from Mexico or Central America. We know this because of something they brought with them: corn. Large amounts of corn pollen were discovered at the Fort Center site in south Florida near Lake Okeechobee. The pollen was found both in the soil and embedded in the paint on buried artifacts thus archaeologists have been able to rule out the possibility of modern contamination. This is a complete enigma because corn is not found any where else in the southeast until over 1500 years later. Thus how was corn, a native plant of Mexico, present in Florida in 850 BC? If it had arrived through overland trade networks one would expect to find evidence of corn all over the southeast long before it shows up in Florida but we don’t. Therefore we know something else about these immigrants: they arrived by boat. Some of the earliest features found at Fort Center are large circular moats. The moats were not all built at once but instead were built one after the other. The first circle was around 300 feet in diameter. It was then replaced by another circle of the same size. Finally a third circle, called the Great Circle, was built to replace the previous circle. It was completed by 450 BC. It has a diameter of 1200 feet, quite an increase in size, and enclosed an area of approximately 23 acres! The moats themselves were on average about 28 feet wide and six feet deep which is amazing considering they were dug by hand using simple shell tools for digging and baskets for hauling away the dirt. Archaeologists believe these circular moats served to drain the land within and around the circle for agricultural purposes. It was within and around these circles that the corn was grown. Access to this interior space was made via two causeways, one from the southeast and another from the northeast. In addition to these circles, small mounds were also constructed. It is believed that a building was constructed atop each mound (perhaps a home or communal structure.) The mounds and the circles were located next to a river currently named Fisheating Creek. The area next to the river floods for weeks and this is the most likely explanation for why the inhabitants needed to elevate their homes and drain their agricultural fields. Most of the people lived on top of natural levees formed by the river. Living next to this river also provided the bulk of their diet which mainly consisted of fish, turtles, alligators and other aquatic species. Archaeologists believe approximately 100 people lived here during this time period. One of the mounds, referred to as Mound 13, was two feet high, built upon a natural levee and contained at least three burials. In association with the burials were the remains of two pottery vessels. It is believed that a building existed on top of the mound and the bodies were interred within its floor. Whether this was a normal house for living or a special mortuary building specifically for burials is unknown. Yet we know later in the site’s history, around 200 AD, a mortuary mound complex was constructed thus this could have been an earlier version. The mortuary complex constructed in 200 AD and used until about 600 AD is the most spectacular part of Fort Center. 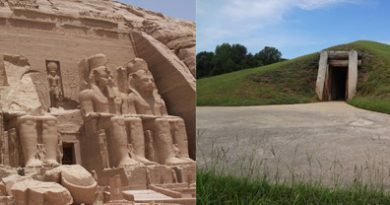 It consists of two mounds (Mound A & Mound B, both once topped with buildings), a pond with an associated wooden platform built within it (from which amazingly life-like wooden sculptures were recovered), and a low earthen wall surrounding the complex. Based upon artifacts discovered during excavation, Mound A appears to be where people once lived. These artifacts were unlike any others found elsewhere at the site including pipes for smoking, tools for carving wood, and raw materials for making stone tools. There were possibly one or two round or oval buildings, thirty feet in diameter, constructed here and the mound itself is a trash midden that built up around this building. From the artifacts it has been suggested this was a “men’s hut” where men gathered to work and smoke pipes. One activity that took place on Mound A has puzzled archaeologists since its discovery. It appears that lime was created by the burning of shells in round pits. This activity took place in and around the oval buildings. Archaeologist have offered many explanations for this lime factory yet seem to miss the most obvious use: fertilizer for growing corn. plaster. When mixed with sand, this lime made a fairly good plaster which could be used on the interior and exterior of buildings. corn processing. In Mexico, lime had been used for millenia in the preparation of masa to create tortillas. Although tortillas do not appear to have been produced at Fort Center, the lime can be used to soften the outer shell of the corn kernel thus making it edible as hominy porridge. This process also increases the nutritional value of the corn. paint. Some of the artifacts discovered in the pond were painted with lime. Once again, corn pollen was found enbedded in this lime paint thus providing more proof of corn production at Fort Center. Lime is regularly used as fertilizer today. The soil at Fort Center was acidic and acidic soils do not contain enough calcium to support prolific plant growth. When soil pH is below 6.0, plants may show signs of calcium deficiency. Without calcium plants will experience yellowing leaves, retarded growth of roots, dieback of growing tips and premature death of older leaves. Soil liming increases microbial activity and the proliferation of earthworms and beneficial insects. There is an added benefit of using seashells to produce this lime because these shells also contain calcium and magnesium. Calcium is not only an essential element for plants but it also improves soil texture, makes phosphorus and micronutrients more available to the plant and improves the environment for microorganisms, the builders of the soil. Magnesium is part of the lifeblood, or chlorophyl, of the plant and controls the development of this molecule. When mixed with water, as the occupants of Mound A were doing, the lime becomes available to the plant immediately. The readily available calcium in the soil around the plants encourages the utilization of other nutrients. The crop responds with vigorous green growth since it can now use nutrients more effectively. Thus lime production at Fort Center was probably first and foremost for the production of fertilizer for their corn. At some point in time, a small pond was dug near Mound A and the fill from this pond was used to create the second mound in the complex, Mound B. This mound started out as a low mound with a flat top where a building was located. This mound appears to have been ceremonial in nature due to the artifacts discovered there. Flakes of red, pink and white chert chips were discovered that matched stone spear points found in the pond associated with burials; thus, it is believed that Mound B was the location for the manufacture of these prestige objects. 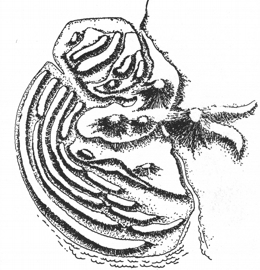 A bathtub-like depression was also discovered inside the structure on Mound B which is thought to have been used to prepare bodies after death. The bodies probably received a thorough “bath” in lime in order to neutralize odor and speed up decomposition. They would have later scraped any remaining flesh from the bones before bundling them for burial. Apparently a large, D-shaped, wooden platform was constructed in the center of the pond upon which were laid the bone bundles of the deceased. The structure was constructed from many large posts. These posts were all topped with very realistic, life-size (and some larger than life-size) carvings of animals ranging from birds (eagles, woodpeckers, osprey, turkey, etc.) to mammals (deer and panther but mostly cat-like animals). Smaller posts decorated the sides of the platform. Dozens of small carvings of animals and birds, just as realistic, were placed on top of these posts via mortise and tenon joints. Evidence shows that this platform was partially burned and collapsed into the pond at some point in time and the bone bundlings were recovered and buried in Mound B. This process entailed laying down a layer of clean sand, placing the bone bundles on top and then covering them over with another layer of clean sand. This process was repeated several times and thus Mound B grew to over 14 feet in height. Not all of the bones and associated burial objects were recovered from the pond and would be found 2000 years later by archaeologists. It is possible that one of the reasons for locating burials on a platform in a pond was to protect the bodies from scavenging by wild animals. Another reason is less practical and based on Florida Indian’s spiritual beliefs. Many tribes believed that water served as a barrier to spirits of the deceased thus preventing them from returning to the realm of the living and causing problems such as sickness. This is an ancient belief going back thousands of years as evidenced by places such as Windover Bog (near Cape Canaveral) where bodies were buried in water. When buried underwater, water also blocks the odors and pathogens (i.e., “evil spirits”) associated with decomposing bodies which probably explains the origins of the spiritual beliefs just mentioned. 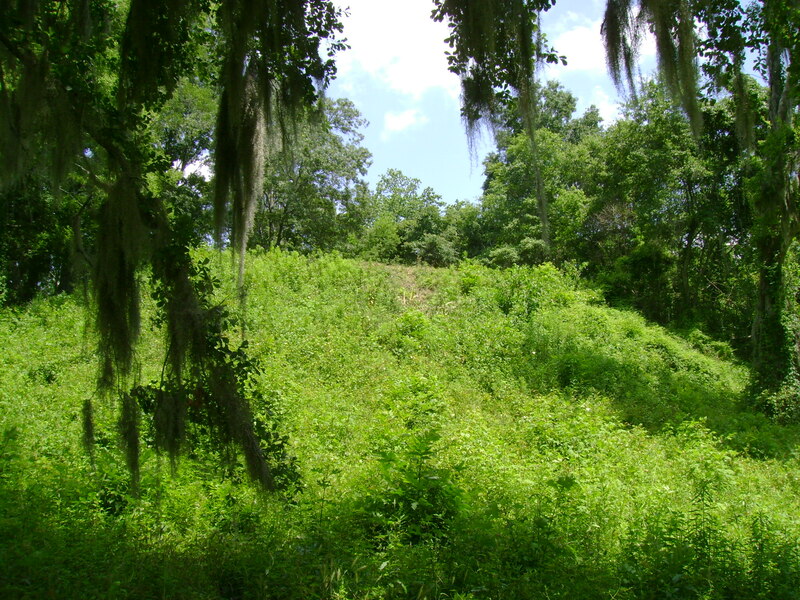 At a previous site in our discussion, Tomoka Mounds, we also find a burial mound with a small manmade pond. Thus burial mounds with ponds have a long history in Florida. Based on artifacts uncovered at Mound A, the people living here were most similar to other Natives from southeast Florida. Therefore it is possible that whoever the original immigrants were who brought the corn, they either merged with the local inhabitants or more likely, simply used the local population to work as laborers in their “corn factory.” Yet these “laborers” were clearly not slaves based on the elaborate burials and grave goods uncovered. They appeared to have profited quiet nicely from their partnership with the newcomers. The question remains: who were the people who brought corn to Fort Center? One intriguing possibility comes from the migration legend of the Hitchiti, a tribe located in Georgia when the first British colonists arrived. Their migration legend states that they emerged from the reeds near the seashore and walked towards the rising sun until arriving at what they thought was the sea but discovered, instead, was a large lake. They stopped here but eventually followed a stream north and settled permanently. This seems like an ancient memory of arriving in Florida by boat and discovering Lake Okeechobee, a lake large enough to be confused for the sea. It appears that they settled near Lake Okeechobee before heading north, eventually settling in Georgia. At the time of European exploration in the southeast, Hitchiti was spoken over most of Georgia and South Carolina. 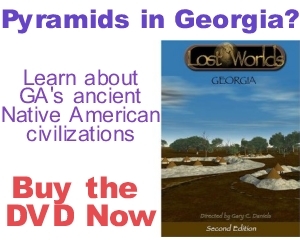 In fact, the Creek speakers insisted that the Hitchiti speakers were in Georgia when they arrived (about 800 AD) and were considered one of the indigenous people of the area. Based on this as well as the fact that Hitchiti place names are located across a large geographic area, it is apparent that Hitchiti speakers were in the southeast for a long time before 800 AD. Therefore they could have been at Fort Center in 450 BC. Is there any linguistic evidence that connects Hitchiti speakers to Mesoamerica? Indeed, there is. In Hitchiti, the word ‘chiki’ means ‘house.’ It also means ‘house’ in the Totonac language on the Gulf Coast of Mexico just north of the Yucatan. (The Totonacs spoke a dialect of Nahuatl like the Aztecs.) In the Itza Maya language just south of the Totonacs, the word ‘chiki’ means ‘woven basket.’ Both the Totonac and Maya words derive from the same root word which has an association with “weaving with reeds.” Interestingly all of these cultures, Totonac/Maya/Hitchiti, built their houses by the wattle and daub method. This method requires weaving thin branches or reeds between upright poles forming the house walls which are then covered with a layer of mud or plaster. Therefore these houses could be considered ‘woven containers’ just as a basket is a ‘woven container.’ Thus the Itza Maya word and the Totonac word are, in fact, related. The Itza Maya were responsible for building of one of the most famous pyramids in Mexico, the Castillo at Chichen Itza in the Yucatan. The word ‘chichen’ in Itza Maya means ‘mouth of the well’ (chi = mouth, chen=well). In Hitchiti, ‘chi’ also means ‘mouth’ and ‘chahni’ means ‘well’ thus ‘chichahni’ would mean ‘mouth of the well.’ A related group known as the Chontal Maya actually referred to Chichen Itza, as ‘Chichan Itza’ or ‘Mouth of the Snake of the Itza.’ Again, ‘chi’ meaning ‘mouth’ and ‘chan’ meaning ‘snake.’ Somehow ‘snake’ and ‘well’ were interchangeable concepts. Interestingly, when the De Soto expedition marched through central Florida in 1539 they passed through a great swamp named Cale’ on their way to a corn-rich province called Ocale’ in Central Florida just north of the Lake Okeechobee region. Ocale’ means “Water People” in Hitchiti and is where the modern town of Ocala, Florida gets its name. After leaving Ocala the expedition next entered the territory of the Potano. Could Ocala and Potano be the Florida equivalents of Acala and Poton? The Putun’s Acala homeland looks amazingly like Florida’s Charlotte Harbor area which is the nearest seaport to Lake Okeechobee and Fort Center. Acala (known today as Chontalpa) is filled with lakes, marshes, swamps, wetlands and rivers. The Hitchiti speakers were also known as Muscogee which means “Swamp People” because of the location of their settlements. Another area that is very reminiscent of Acala is the coastal areas of Georgia. Coincidentally during the historic period we find a Hitchiti-speaking tribe living in this area on the Altamaha River called the Tamali (Tama people). Usually translated as “Drum People” based on the Hitchiti word for drum “tamamakti”, could this tribe have actually been known as the “corn dough people” at an earlier time due to their trade in ‘tamal’ or processed corn dough? Several other Hitchiti towns in Georgia and North Carolina were also named Tamali, Tamahle, Tamatli and Tomotla and they were all located on rivers or the junction of rivers. The Putun’s homeland was on the periphery of the Classic Maya area and no evidence has been found indicating they were involved in the great artistic, architectural and scientific advances of their neighbors. Perhaps they could be called the illiterate cousins of the Maya. Thus either the Itza or Putun, both being great sea traders, could have made the voyage to Florida with the more likely candidate being the Putun. A map showing the currents of the Gulf of Mexico reveals that a journey to Florida would be very possible. The Gulf Loop is a strong current in the eastern Gulf of Mexico that would give canoes a free ride from the Yucatan to the Florida Keys. Thus, a small group of Putun could have made it to Florida, entered Charlotte Harbor and settled near Lake Okeechobee. 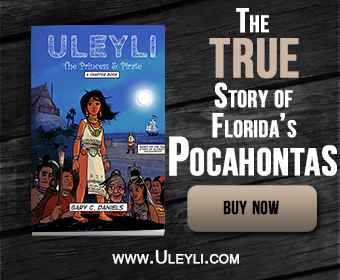 Interestingly, the name given to Lake Okeechobee by Native Americans in south Florida during the historic period was “Mayaimi” (from which the city of Miami takes its name) and a river near this lake was called “Mayakka.” Even more interesting, the ancestors of the Putun- the Olmecs- claimed to have come from the east by boat. Since we know they originally settled in Veracruz on Mexico’s gulf coast, the only place east of there is the American southeast. The only similar mound building culture in the American southeast at this time was the Poverty Point culture in Louisiana. Poverty Point culture also appears to have favored wetlands, marshes, rivers and river-lake junctions as settlement locations. They also had an extensive maritime trade network with artifacts being found as far as east Texas and outposts in Charlotte Harbor at Big Mound Key and John Quiet Mounds. The Gulf currents from the Mississippi river in Louisiana flow directly along the Mexican coast by Veracruz thus it would not have been impossible for the Olmecs to have travelled from Poverty Point. Thus, could the Putun have made an exploratory voyage to the east of Yucatan in search of their fabled ancestral homeland but, due to the different currents, landed in Florida instead? There’s no easy way back to the Yucatan from Charlotte Harbor thus they would have been stuck. Perhaps they decided to make the best of their situation and began establishing new trade routes and taking over older ones in the coastal areas of the southeast. There was an enormous amount of corn being grown at Fort Center that could not have been completely consumed by its inhabitants. It takes approximately 1/10 of an acre to grow enough food for one person for a year using organic methods. Thus one acre would support ten people if their diet was exclusively vegetarian. But as noted earlier, the people at Fort Center ate mostly an aquatic diet of fish, turtles and alligators. The interior of the Fort Center circle was 24 acres and thus could have produced enough food to feed 240 people. Yet the moats drained an area twice this size effectively doubling the amount of land in production bringing the total people who could be fed to 500. Now add to this the three growing seasons of south Florida and Fort Center could produce enough food to feed 1500 people a year an exclusively vegetarian diet at this one site alone. Since most people were not eating exclusively vegetarian diets and probably used corn flour to supplement their diets, the corn from Fort Center could have been distributed to thousands of people. Plus there were several other large circle-moat systems in the Lake Okeechobee area. This was large scale industrial production meant for trade and not local consumption. Fort Center was in operation at the same time as the two previous sites in our story, Big Mound Key and John Quiet Mounds. Thus it is likely that Fort Center was engaged in the same trade network. It was pointed out that these coastal sites appeared to be “factories” for shell tools, ornaments, jewelry and perhaps even salted, dried and smoked seafood. Similarly, Fort Center would have been a factory for corn flour (as opposed to corn.) It would make sense to only trade the dried corn flour because then your trading partners couldn’t grow their own corn and would be dependent on you to supply their needs. This could also explain why no corn appears anywhere else in the southeast during this time. Fort Center would also be the perfect location for this operation since, being located in south Florida, it would experience three growing seasons. Much later in Fort Center’s history (1200 – 1400 AD) circular and linear mounds were constructed which have been interpreted as house mounds with extended raised agricultural fields. The next site in our story, Ortona, contains more evidence that the people who arrived in Florida were from the Gulf Coastal regions of Yucatan, Mexico. The Ortona site contains both transportation canals, the first such built in America, and u-shaped ballcourts which are also hallmarks of Putun and Hitchiti cultures.